The Report Server web application, enables you to generate reports on data you have imported or created in InterPlay or imported to Datastore. Report Server interactions in a Datastore configuration. The Report templates generation strategy is configured in Designer for Collection Types and Object Types using the Reporting property. None: No default report templates are generated at deployment time. Auto(default): Default report templates are generated automatically when needed at runtime. Manual: Default report templates are generated at deployment time. 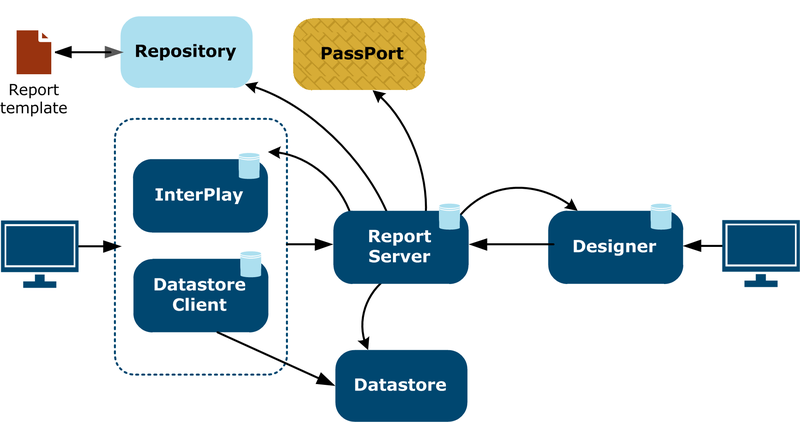 At design time, when you deploy the configuration into the Repository, InterPlay uses the Report Server to create default libraries and default report templates for every collection type and object type that has the Reporting property set to Manual. At runtime, user privileges are used to filter out the list of report templates, as well as the data that is visible in the generated reports.